Caol Ila Distillery stands on the shore of the Sound of Islay about half a mile north of the village of Port Askaig, and is reached by means of a minor road that leaves the A846 a short distance inland from the village. When whisky writer Alfred Barnard visited in 1886 in a horse drawn dog-cart he found the road's final descent down to the distillery so steep that he and his party got out and walked. The steepness of the final descent to Caol Ila remains, but much else has changed since Alfred Barnard visited. The three storey bonded warehouse at the distillery's southern end, which carries the distillery name in large black letters at just below roof level would have stood here in the 1880s, but the production side of the distillery was completely rebuilt between 1972 and 1974. 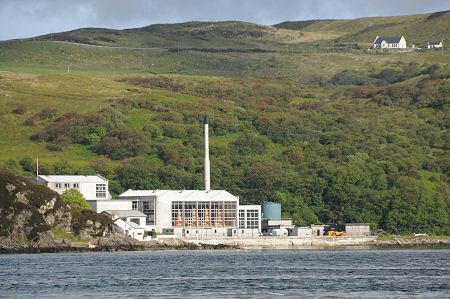 The result is the huge glass fronted stillhouse which dominates views of the distillery from the Jura ferry. At this time the number of stills was increased from two to six. Caol Ila Distillery was established in 1846 by Hector Henderson. In the early days it did poorly, and it had changed hands in 1852 before being bought by Bulloch, Lade & Co in 1863. Success followed, and in the late 1870s the distillery was rebuilt and expanded, a process which according to Alfred Barnard involved the building of "a fine pier at which vessels can load or unload at any state of the tide". Caol Ila became part of Distillers Company Ltd in 1927, and in 1930 it was transferred to Scottish Malt Distillers Ltd, who ceased production here. It reopened in 1937 and has since gone from strength to strength, and as already noted it was largely rebuilt in the early 1970s. It now forms part of the Diageo stable of distilleries, and is known for producing whiskies which by Islay standards are of medium peatiness. The observant will have noticed that this is a rather shorter feature than is the norm for a distillery on Undiscovered Scotland. When we last visited Islay in June 2011, Caol Ila was in the midst of a major refurbishment that had turned it from a distillery into a building site, and was likely to keep it as such for the remainder of the year. The truly observant might just spot the large yellow digger in the header photo. Port Askaig, Isle of Islay, PA46 7RL.